The increased load and pressure of a virgin world-title defence often proves too much for the returning champion. But while some find the expectation crippling, others crave the spotlight and succeed in securing back-to-back titles. 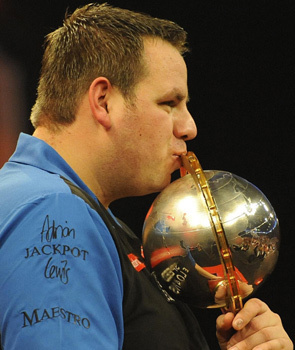 Adrian Lewis has no doubt which category he will fall into when he begins his Ladbrokes World Darts Championship defence on December 15. The 26-year-old is not merely confident of retaining his crown but hopes to emulate the likes of Phil Taylor and snooker’s Stephen Hendry in becoming a serial world champion at Alexandra Palace. Lewis, bidding to become only the second man in history to retain the PDC championship, after 13-times winner Taylor (who also has two BDO world titles), is already plotting further glory. He wants to exert his own stranglehold on the sport after two decades of darting dominance from Taylor. The Sport Collective found Lewis in ebullient mood as we sat down to discuss his first year as world champion and his imminent title defence. “I’ve set my sights on winning between eight and ten world titles. I think that is a realistic number,” he said. Lewis hopes the hunt for the game’s biggest prize will inspire him to recapture the scorching form of 12 months ago. Scotland’s Gary Anderson was blitzed in the final as Lewis threw the first nine-dart 501 in World Championship final history and went on to establish a new tournament record of 60 180s. These are feats the rest of the field will have tattooed on their subconscious, if not their throwing arms. The world No 2′s performances have been steady rather than spectacular this season. The plan was always to peak for the Ladbrokes World Darts Championship and Lewis looked back to somewhere close to his best at the Grand Slam of Darts in Wolverhampton last month, until he ran into a possessed Taylor at the semi-final stage. Long seen as the heir apparent to ‘The Power’, Lewis may have to seek royal counsel from Prince Charles on lengthy coronation waits – as Taylor shows no obvious sign of decline or the inclination to abdicate soon. The added billing of world champion naturally heightens expectations, but Lewis disputes the notion that he is under more strain than his rivals ahead of the biggest tournament in darts. “As far as pressure goes, I firmly feel the other players are under just as much pressure as I am,” he said. Lewis expects his main challenge to come from higher echelons of the world rankings and does not envisage too many surprise results from the quarter-final stage onwards. Lewis has always bristled at the suggestion that Taylor acted as a mentor early in his career. Their locality enabled them to practice together regularly, but theirs was no special master-student bond. Lewis thinks too much is made of the Stoke association, even though the Potteries has produced three world champions, two-time BDO world champion Ted Hankey, the game’s pantomime villain, making up the third. However, if Lewis wanted, or indeed needed, someone to play Mr Miyagi to his Daniel La Russo he appears to have found that individual in new manager Keith Deller. The 1983 Embassy World champion’s arrival has undoubtedly made the Lewis camp more efficient. A significant change this year has been the toning down of the Lewis walk-on routine. The man nicknamed “Jackpot”, after a $75,000 Las Vegas casino win he was too young to claim, believes his televised pre-match japes had become an unwelcome distraction, so a conscious decision was made to adopt a more low-key approach in recent months. A significant equipment change is considered a gamble in most sports. In darts it can prove devastating. A professional’s arrows are almost a bodily appendage. The tiniest alteration in feel or weight can throw a player totally off kilter. A lost or damaged dart is a major problem, let alone a complete redesign. Lewis’s mid-season switch of manufacturer raised eyebrows on the circuit and he admits it took time to fully adapt to his new weaponry. Lewis accepts he may have lost some tournament sharpness this season as a result of playing too many exhibitions, and plans to think through and tighten his schedule next year. Lewis, softly spoken away from the oche, comes across as an affable gentle giant; the type you might find in a Brothers Grimm fairytale. This persona is totally at odds with the bold, self-confident showman you see at the board. He keeps concocting new challenges to keep his mind fresh and confirms rumours he nailed six bullseyes in a row at one exhibition this season. His head-to-heads with current BDO king Martin Adams captivated darts fans, but in reality were no more than glorified exhibitions. Lewis sounds a little weary when this year’s so-called unification clashes are brought up. In a sport where perceived slights and falling-outs are jumped upon by the game’s broadcasters and fans alike, Lewis is keen to play down any bad blood or rivalry with England captain Adams. In a sport where millimetres are inevitably the difference between joy and sorrow, certain competitors excel in the dark arts and push the boundaries of fair play to the limit. Lewis is convinced he now has the experience and temperament to avoid the flashpoints that occasionally marred his early years as a professional. A naturally quick player, he at times struggled to cope with the tactics adopted by some of the game’s more deliberate practitioners. Lewis begins his Ladbrokes World Darts Championship campaign against rank outsider Nigel Heydon on Friday December 15. While few pundits expect him to replicate the scintillating form of 12 months ago, the man himself has no such doubts. Lewis travels to north London fully expecting to scoop the jackpot. Great article, would love to see footage of Lewis throwing bull bull bull bull bull bull! As a genuine darts enthusiast it is interesting to compare this piece with the Guardian’s Adrian Lewis interview conducted by the excellent Donald McRae, as both were published this week. Unsurprisingly McRae chooses to labour the human angle as he discusses Lewis’ struggles with fame, his relationship troubles and even looks at his absent father for clues. It is a solid piece of work and expertly written as you’d expect from one of the field’s leading lights. But it is lazy when it comes to actual sporting content. The author has not really attempted to research the sport of darts at any length. The questions on the Target sponsored game with Manny Pacquiao are fun but of no real value. A blatant plug for the sponsor that set up the interview no doubt. It also features all the usual Phil Taylor guff without Lewis ever saying Taylor was his mentor or teacher. Your angle of attack and content is in my mind worthier as the writer clearly understands the sport and the darting issues Lewis has had these past 12 months. We get an admission that Adrian had real problems with these new Target arrows. We hear about walk-ons, preparation and long term darting goals. We also get proper views on the upcoming World Championships and his main rivals. The strain of exhibitions are discussed, gamesmanship, the lack of weekend match sharpness and some lovely info for us anoraks – the six consecutive bulls line. You also examine the real relationship of interest, Lewis and Keith Deller. The prose is no less lyrical than McRae’s. The uninitiated are not ignored and the real darts fan learns something new. For me it is a far more informative read. While it is great to see darts getting broadsheet coverage and recognition, I always feel these forays into the sport are almost always sloppy. The tabloids give you a few paragraphs of witty copy most weeks especially the punchy Mike Walters at The Mirror, but they can’t deliver quality or quantity like the Sport Collective has here. The video links must have taken time and passion to find and are a great added bonus. We even get to see the Karate Kid! The darts boom means we are seeing more articles like this and long may it continue. Martin it is unfair to compare this to the Guardian feature as two good writers have simply attacked their interviews in a different way. One chose a lifestyle angle the other the sports approach. Both solid. I think Adrian was mad to switch to Target dartsoon after becoming world champion. He can’t admit but it’s been a disaster. Interesting to read here that he thinks he can win 10 world titles. Big statement and one the other players will no doubt pick up on and want to ram down Adrian’s throat this month. I don’t see Lewis winning this year. I like Gary Anderson, Wes Newton and obviously Phil Taylor. Lewis was dead on his feet. Nearly curtains on opening night. I think his new darts are still troubling him. Lots of work to do. Brilliant read! fair play to Adie he has delivered his promise last year and it is all down to his own natural talent. 10 world titles though! thats a big ask! the competition is so strong these days as we saw in Lewis’ game against Heydon last night! Most of Taylors titles (pre 2006)were won when the BDO was agruably stronger. Lewis looked petrified against Heydon. 1st round nerves maybe but I sensed real fear. I’ve always warmed towards Jackpot he is a gentle giant you’re correct. Webster did Lewis a favour last year in seeing off Taylor. For Lewis to win again he cannot meet the Power in the final. If someone else takes Taylor’s scalp Lewis might retain the trophy but he needs to hammer that board over the next few weeks, because on current form he has no sniff. Mr Miyagi v Keith Deller best of 4. Darts, fly catching, most shots of vodka then Karate!!!! Could go either way. Phil Taylor out, Barney out. This is some tournament, the nation’s in love with darts. I think Lewis can defend now the main threat is out but this is the best standard ever, anyone left can lift the trophy. I found the quotes here ballsy and confident, Adrian is the man to beat even more so now Taylor is out. Gamesmanship section also interesting everyone trying to slow down the Lewis type players. Pipe is the worst, I’d throw a dart at him. Team Lewis on the up and hunting another title. If only it were true. Crazy, you asked him this and then he blew up on the biggest stage of all. The most in-depth player interview by a distance pre-tournament. Adrian’s confidence was clearly justified after last night’s triumph. His reception from the crowd was nothing short of a disgrace. Now a back-to-back champion I hope he gets the full respect his amazing talents deserve. Keep up the great work, this website is really good. Just need a few more articles so I check back regularly. I enjoyed Sean’s tweets from the PDC Ladbrokes world chamiponships. As he knows the Simon Whitlock camp I urge him to do a feature on the Wizard ahead of the Premier League now Simon has secured his wildcard invitation. Whitlock is a personal favourite of mine, going back to his BDO days. An interesting character of whom we don’t hear a great deal. Im still disappointed he didn’t get over the line against Hamilton and I’m sure we all in agreement, it would have been a better final.